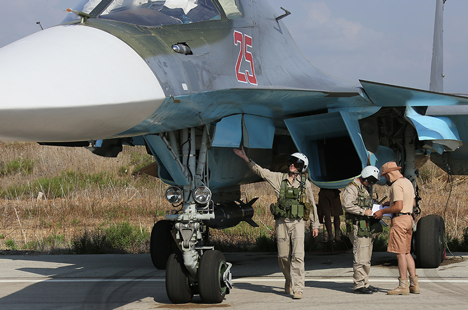 Russian pilots at Hmeimim airbase in Syria. Russia began aerial strikes against strongholds of the Islamic State (ISIS) in Syria last week. Russia would not be part of a US-led coalition but proposed the creation of a wider international coalition to resolve the crisis in Syria. While the Indian government has not officially commented on the strikes, RIR asked some Indian analysts if the United States and Russia could overcome differences to jointly remove the threat of radical Islamic terror in West Asia and Syria after ISIS. The Indian government has not commented on the Russian air strikes on ISIS targets in Syria, but is “in touch” with both the Russian and the Syrian governments on the issue, MEA spokesman Vikas Swarup said. A joint statement issued after the third India Germany Inter-Governmental Consultations (IGC) between Indian Prime Minister Narendra Modi and German Chancellor Angela Merkel earlier this week, “called for a political solution in Syria to successfully fight terrorism and end the violence there”. The two leaders also articulated their “common concern about the growing threat and global reach of terrorism and extremism” and underscored their “readiness to build closer collaboration to counter these challenges”. Senior Congress leader Mani Shankar Aiyar did comment on the issue, saying President Putin “has correctly identified the enemy in West Asia”. “It is not the existing regimes, it is the Islamic State. International obligation today is to fight ISIS, not to change the regimes. Unfortunately, Western powers are concentrating on changing regimes,” he said. According to Aiyar, a former diplomat, by “knocking out Saddam Hussein the fracture, in which ISIS stepped in, had been created”. Aiyar calls for “cooperation between Western countries and Russia to contain the menace of terrorism, which is represented by Islamic State”, but would not predict such a possibility. “I hope that United States and their friends in Turkey, Saudi Arabia, and the Gulf can be persuaded that the need of the hour is not the removal of Bashar al-Assad, but the menace of ISIS,” he said. Talking about future of Syria, Aiyar sought “containing the matter with dialogue” or by “showing strength but not actually using it”. “If it had been in Jawaharlal Nehru’s times, India would not have intervened militarily, but would have expressed a view and tried to generate international opinion in favour of a peaceful solution to the problem,” he said. “But beyond this political and diplomatic support, India is actually not in a position to intervene in Syria,” Aiyar remarked. Nandan Unnikrishnan, vice-president and senior fellow, Observer Research Foundation, a leading Indian think tank, said there would be changes with the start of Russian military operation in Syria. “It will significantly bolster Assad's position in the battle for the future of Syria, although it appears unlikely that the Syria will reemerge reunited and in the same geographical boundaries. But any real change will depend on the nations supporting the anti-Assad, anti-ISIS groupings,” he said. If the West decides to join an anti-ISIS coalition with Russia then, “significant forward movement can be achieved towards finding a political solution of the Syrian problem,” Unnikrishnan said. Declining comment on the long-term strategic impact of the operation, he said, “It is definitely a major tactical achievement for Russia”. “It would significantly enhance the long-term prospects of stability in West Asia, if Moscow can follow this up with stitching together a coalition against ISIS and, along with Iran, lead the international process to find a political solution in Syria”, the expert added. Commenting on India`a stand on Syria, he said, “India's approach will be determined by its national interest.” “India wants peace in its neighborhood and a stable West Asia is part of that vision,” Unnikrishnan said. “All the points he has made are valid. His analysis of the results of foreign intervention in the Middle East and North Africa are correct. We can see the results ourselves on the ground,” said Sibal, a former Ambassador to Russia. Does Moscow plan ground ops in Syria?